When it comes to hunting deer, like anything else, you often don’t know what you don’t know until it’s too late! Proper care of game meat, deer vocalizations, and even the weather forecast will all play important roles in your hunting success and enjoyment. While there is a great deal to be said for hunting knowledge passed down from mentor to apprentice, today the information you need is really only as far away as your smart phone. Your deer is down! Yahoo! You can’t wait to get back and share your news with your campmates. You have the gear you need and your trusty, ultra-sharp Buck Knife is in hand … but what next? This is the first deer you’ve taken by yourself with none of the old timers around who were always anxious to show off their field dressing skills! Well – there’s an app for that! Don’t be offended by the name, but it’s called DeerDummy.com, and it’s designed specifically for anyone looking to learn or perfect field dressing techniques. The guys behind it have more than 30 years of professional meat cutting experience. It includes both a video tutorial and step-by-step photos to guide you through field dressing your deer safely and sanitarily. DeerDummy.com is just $3.99 and is available for both iPhone and Android platforms. Knowing the sounds deer make, understanding which sounds are attractive and which keep them away, being able to make those sounds on your deer calls, and knowing when to make them are all skills that will boost your odds of success. The problem is, as much as you’d love to be in the woods all the time learning from the deer themselves, your lifestyle and location just don’t make that possible. So when you’re in your stand you’re always second-guessing yourself about calling. Should you or shouldn’t you? There’s an app for that! Actually there are a bunch of apps for that! Go to iTunes or Google Play and simply search “deer calling” and you’ll see the many apps available. Be sure to know the regulations where you are hunting. In many places it’s illegal to use electronic or digital calling to bring in whitetail. 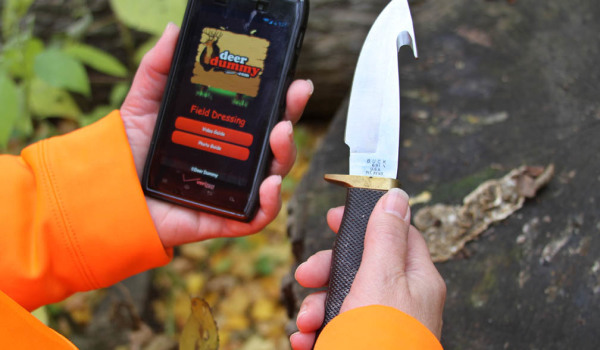 The deer calls in the app should be used as a guide by which to learn to make the calls and sounds yourself. Critical factors in deer hunting success that change daily are winds and weather. It doesn’t matter what the weather in town is doing. You need to know what it will be doing in your hunting area … better yet, at the exact locations of your stands. You know what? There’s an app for that! It’s called ScoutLook Weather. It takes the extensive weather forecast information hunters need, including the all-important wind direction, and geocodes it to the hunter’s current location and to saved locations. With the unique ScentCone wind maps, deer hunters can “see the wind” now and out 72 hours at any location. ScoutLook also integrates ScoutMarX tools with which hunters can save noteworthy locations such as scrapes, rubs, bedding areas, etc. for future hunts. The phone app also synchronizes with the user’s web-based account. Search ScoutLook Weather in iTunes or Google Play, or online: There’s even a free trial version sponsored by Mossy Oak.